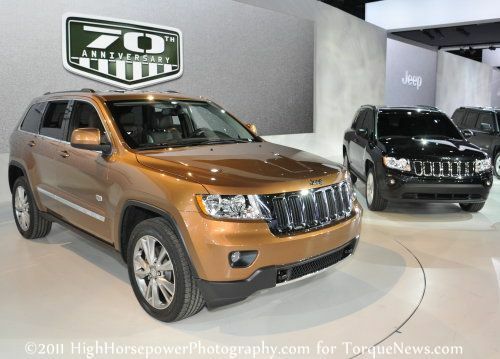 The 2011 Detroit Auto Show marks the 70th birthday of the legendary sport utility brand and to commemorate that occasion, Jeep introduced the 70th Anniversary Edition trimlines available across the entire brand. The 70th Anniversary Edition packages for the different Jeep models include varying features depending on the vehicle but all of them receive dark interior finish with lots of chrome, special stitching and badging, special 70th Anniversary model-unique wheels, and exterior badges recognizing the brands 70th birthday. These vehicles are all available in three exterior colors – Bright Silver, Black and the exclusive Bronze Star (shown on the 2011 Jeep Grand Cherokee above). In addition to showing off the 70th Anniversary Edition of the 2011 Grand Cherokee, Liberty, Patriot and Wrangler, the 2011 Jeep Compass was introduced with the 70th Anniversary badges playing second fiddle to the fantastic new front end. The redesign of the 2011 Compass gives the compact sport ute the look of a mini-Grand Cherokee and surprisingly, the Compass wears the Grand Cherokee’s look very well. The popularity of the Grand Cherokee should help improve sales of the Compass, as consumers can now have the look of the bigger Jeep with the fuel economy of the compact Compass. The 2011 Wrangler, Compass, Liberty, Patriot and Grand Cherokee drew plenty of attention to their display but in order to add that little extra pizzazz to the display, Mopar brought out a 2011 Jeep Wrangler Call of Duty: Black Ops Edition clad in a catalogs-worth of off-roading accessories. Things like the heavy duty front bumper equipped with a winch, the tubular doors, a Mopar exhaust system and snorkel intake take the mild-mannered Wrangler and turn it into a vehicle worthy of the Call of Duty name. Check out the gallery below for a closer look at the Jeep display from the 2011 Detroit Auto Show and stay tuned to TorqueNews.com as we finish up our final few days of coverage from Cobo Hall!